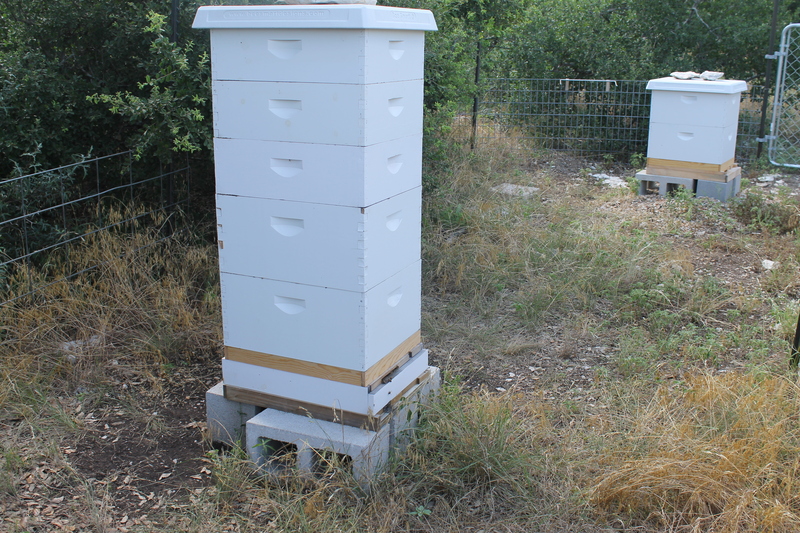 I added a third super to hive one this morning, checker-boarding two of them to give the girls plenty of space. 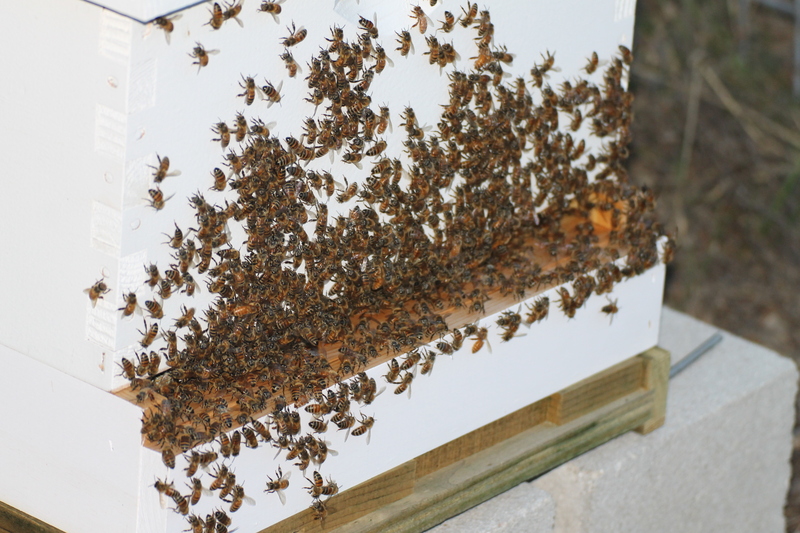 This hive has been pretty grouchy for the past several months since the queen upheaval and swarms in March and April. Today, they paid me no attention at all. I had my smoker at the ready and didn’t even use it. It was a clear sunny day and pretty warm, so I think they were just busy doing bee things and trying to keep cool. I guess when I’m dripping with sweat, they’re happy and calm. I checked a couple of frames in the brood chamber and there is lots of capped brood and new larvae. This queen lays all the way to the bottom of the frames, make good use of the space. 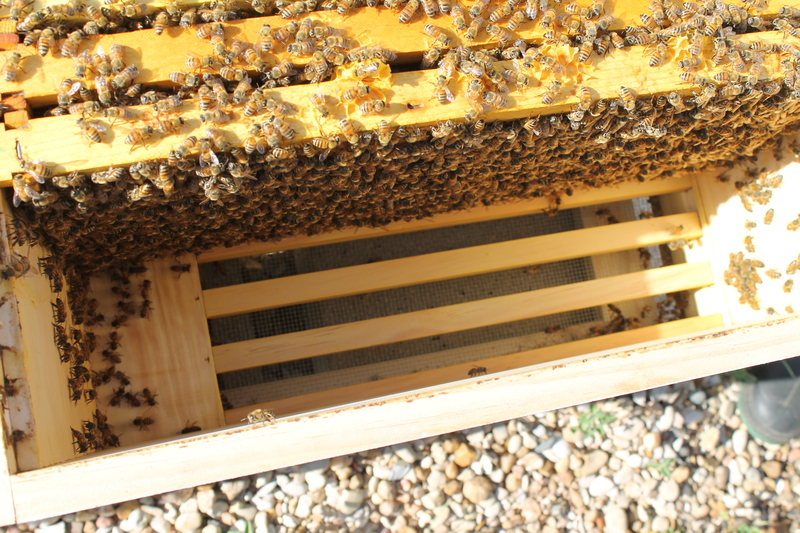 I did a quick check of the brood chamber in the new hive as well, pulling just two or three frames. 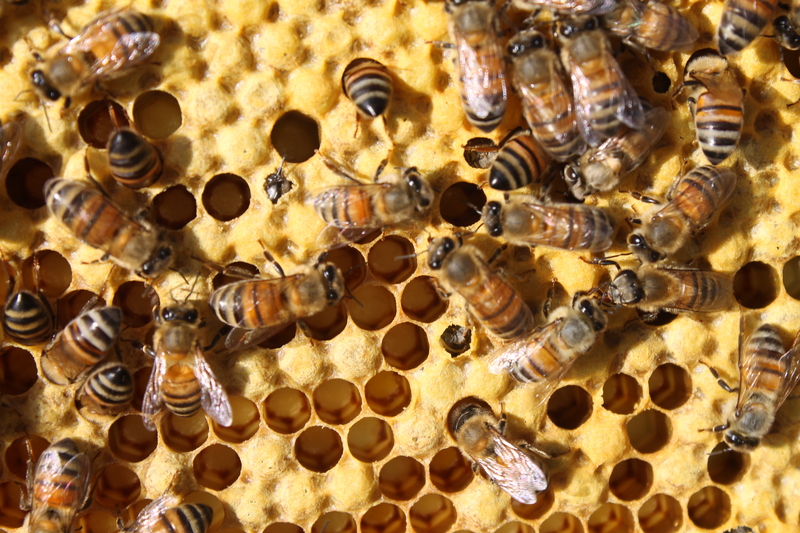 They are storing lots of nectar for honey, but there is also some capped brood. 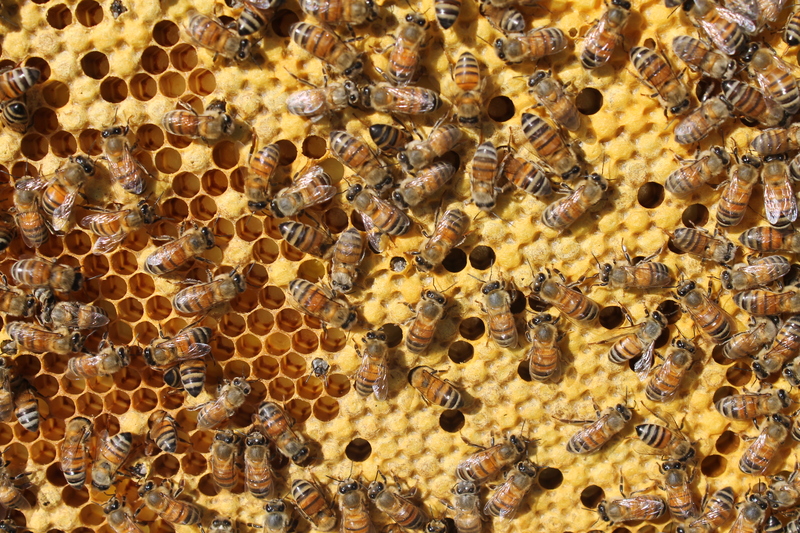 I would like to see better production, but perhaps the hive body below is better populated. I’ll check that later in the week. Hopefully, they’ll have a growth spurt soon so they’ll have a strong population going into fall and winter, although the first hive hardly slowed down on its growth during the winter. It all depends on how cold it gets. I am thrilled at the effects the slatted racks have on the hives. Last year, when it started getting hot, the bees would congregate outside the hive in giant masses called bearding. They were just about melting in the heat. The slatted racks have obviously improved airflow greatly and the bees are not gathering outside, even in the hottest part of the day. Last year in late May. Sometimes there would be bees all the way up the front of the hive. The thermometer says it’s in the mid-90s today and there are no bees gathering outside. The difference is amazing. It’s been a little over a month since we introduced the new queen to the original hive. Two weeks ago we checked to see how she was doing and found that she had lots of new larvae as well as capped brood. 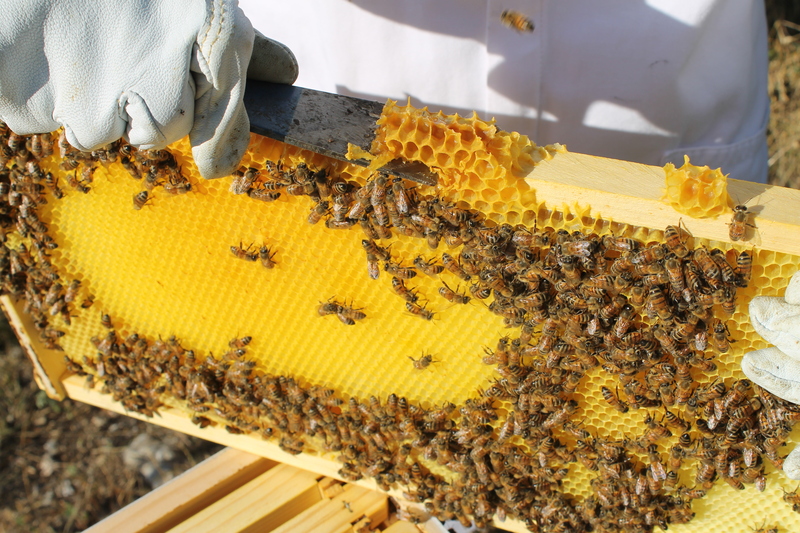 We also noticed that the bees are much tidier now, with not extraneous comb on the tops of frames. Then, as well as now, the bees in this hive are easily agitated and are much more aggressive when we’re inspecting, and smoke doesn’t calm them at all. Later in the morning, several came out while I was watering the garden to harass me, head-butting me and buzzing their annoyance at me. I took the hint and left the area. The queen in the split hive is doing well, though not laying as much as the BeeWeaver queen, but we saw new larvae and capped brood two weeks ago and again today. We also saw a lot of dead bees. Not an alarming number, but more than expected. Perhaps they are old bees that had one to many foraging flights. This is something I will definitely be watching. This queen is a daughter of our first queen, and she has clearly inherited both the calm nature as her mother and the messiness, both of which are displayed in the workers. Every time I open the hive, I have to scrape out excess comb because they glue the two layers of the brood chamber and hive body together. Like mother, like daughter. I added a slatted rack under both hives. This is a piece of hardware I read about last year on Honey Bee Suite. It provides about three extra inches of space below the hive body and its purpose is to help regulate the temperature in the hive and allow extra space for the foraging bees instead of entering the hive and immediately having to work their way up through the frames. 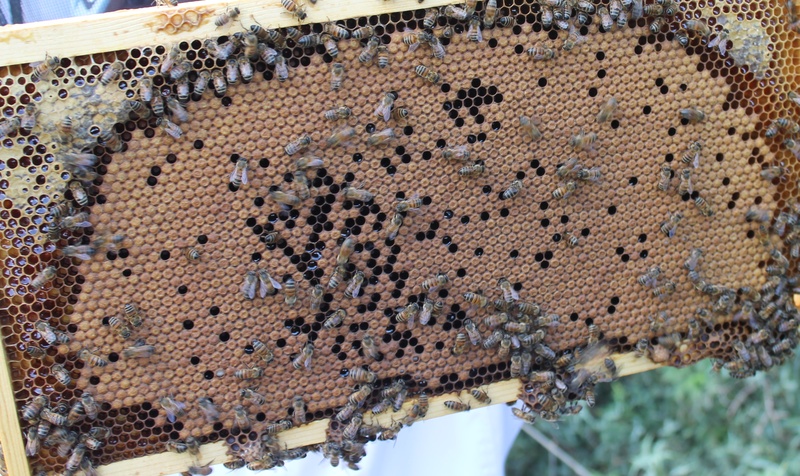 It also encourages the queen to lay eggs all the way to the bottom of the frames, rather than closer to the center. The queen in hive 1 has laid eggs all the way to the bottom of the frame. I’ve noticed a significant difference this summer. The bees aren’t crowded around the entrance or hanging out on the outside of the hive, so it appears to be working. Given the messiness of the split hive, I was concerned they would build comb between the slats, so we checked it today. Not a bit of comb was in it. A view through the hive to the slatted rack below. While we were checking out one of the frames in the split hive, we saw at least five capped brood cells hatching. It’s always fun to watch a new bee emerging. Look closely and you can see tiny heads beginning to poke out from the capping. There are three bees emerging in this area. Can you see them? I didn’t look for the queen in either hive today. I just wanted to make sure both were laying and had a good amount of new brood growing. Evidence of their work was enough for this inspection.